Thomas-Siegler House and Garden -- Historic Takoma, Inc.
At the corner of Tulip and Cedar Avenues, just a few blocks from the Metro station linking suburban Takoma Park, MD with Washington, DC, resides the historic Thomas-Siegler property. Located in the Takoma Park Historic District, which is listed in the National Register of Historic Places, the one-acre parcel is adjacent to many of the Victorian frame houses that characterize the city. For over 125 years, the property's large white oaks and under growth of magnolia, rhododendron, mountain laurel, azalea, and other plantings have been the setting for the Thomas-Siegler main house and carriage house. . 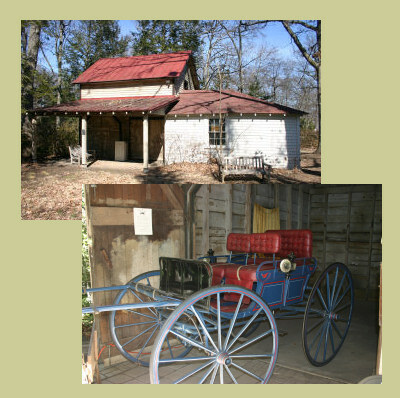 In 1995, Historic Takoma opened the Thomas-Siegler Carriage House Museum on the site. The museum will retain the carriage house in its original configuration and will also include exhibits from the entire spectrum of Takoma Park's history. The Garden is open to the public from dawn to dusk. There are two points of access - the pathway across the street from 214 Tulip Ave., and the pathway that branches off to the left as you approach the main house at 201 Tulip Ave.